"We're a public library, we're not a shelter for the homeless." 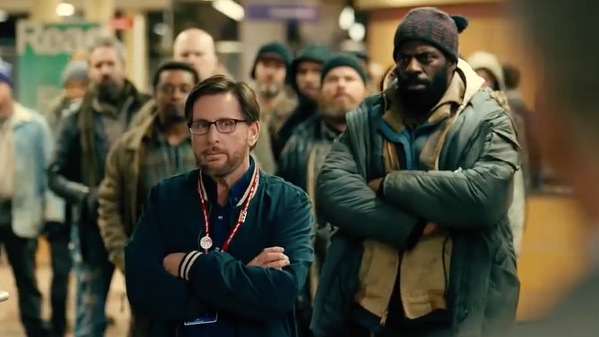 The first trailer has debuted for the latest film written & directed by Emilio Estevez (where has he been all this time?) titled The Public, which is a reference to a public library in Cincinnati. On top of writing & directing, Estevez also stars as one of the managers of the library. When an Arctic cold comes into the city, a group of homeless people decide to hold an "occupy" movement and camp out in the library. The full cast features Jena Malone, Christian Slater, Alec Baldwin, Taylor Schilling, Gabrielle Union, Michael Kenneth Williams, Jeffrey Wright, Ki Hong Lee, Richard T. Jones, and Jacob Vargas. This actually seems like a fascinating take on this kind of story. Pretty much every public library in every city has to deal with homeless people, and yet this seems to show how important this place is to the community and to these people, it's a nice twist on the norm. I am quite curious about the various angles of this story they're playing with in the film. Definitely worth a look. An unusually bitter Arctic blast has made its way to downtown Cincinnati, OH and the front doors of the public library where the action of the film takes place. The story revolves around the library patrons, many of whom are homeless, mentally ill and marginalized, as well as an exhausted and overwhelmed staff of librarians who often build emotional connections and a sense of obligation to care for those regular patrons. At odds with library officials over how to handle the extreme weather event, the Patrons turn the building into a homeless shelter for the night by staging an "Occupy" sit in. What begins as an act of civil disobedience becomes a stand off with police and a rush-to-judgment media constantly speculating about what's really happening. This David versus Goliath story tackles some of our nation's most challenging issues, homelessness and mental illness and sets the drama inside one of the last bastions of democracy-in-action: your public library. The Public is both written and directed by actor/filmmaker Emilio Estevez, who previously directed the films Wisdom, Men at Work, The War at Home, Bobby, and The Way. There's no release date info available yet for The Public, stay tuned for updates. First impression?